New (OEM - Open Box) TI-83 Plus - 10 Pack - Very Limited Stock Left - Bulk Packaging - Save 25% off of Retail new, by buying OEM with Included 1-year warranty. For students in math and sciences, or for anyone new to graphing calculators, Texas Instruments has created the TI-83 Plus--a powerful, problem-solving tool with features for storing, graphing, and analyzing up to 10 functions. Plus, it displays graphs and evaluates tables on a split screen, allowing you to trace the graph and scroll through table values simultaneously. The clear, readable display exhibits 12 characters and eight lines, in 64 x 96 pixels on an LCD screen. 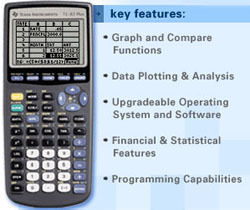 The TI-83 Plus has a pragmatic key layout and an easy-to-use graphing interface, with a simple programming language for creating conversion programs. The TI-83 Plus stores and analyzes up to 10 matrices combined with data storage in lists containing up to 999 elements per list. You can also solve equations interactively for different variables. With the TI-83 Plus, you can view an equation, its graph, and the coordinates all at one time. Jump from point to point by entering a number. Several useful plot types are available, including scatter, box-and-whisker, XY-line, histogram, and normal probability plots. Advanced statistics and regression analysis, graphical analysis, and data analysis are readily accessed, along with features for calculus, engineering, financial, logarithm, trigonometry, and hyperbolic functions--all crucial tools for advanced analysis. With its clear display and fast processing, the TI-83 Plus incorporates graphing tools for mathematics and science course work, including statistics and finance. Incredibly useful for college boards--PSAT/NMSQT, SAT I, SAT II, Math, IC, and IIC--the TI-83 is essential equipment for advanced placement courses in chemistry, physics, and calculus. The addition of the optional TI-Graph Link (software and cable) allows you to connect the calculator to your computer, permitting the transfer of files and data between machines. The TI-83 is powered by four AAA alkaline batteries and one lithium battery for backup, with an automatic shutoff to save energy. It also comes with a hard slide cover. The TI-83 Plus has a pragmatic key layout and an easy-to-use graphing interface, with a simple programming language for creating conversion programs. The TI-83 Plus stores and analyzes up to 10 matrices combined with data storage in lists containing up to 999 elements per list. You can also solve equations interactively for different variables. 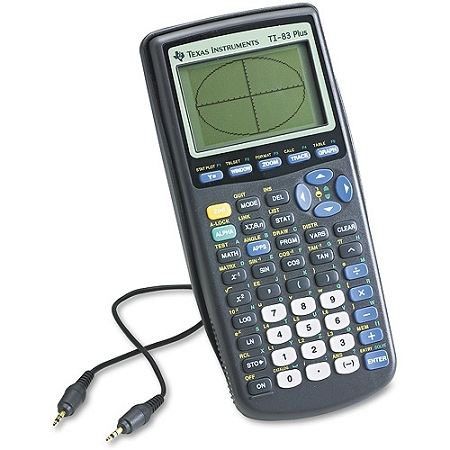 With the TI-83 Plus, you can view an equation, its graph, and the coordinates all at one time. Jump from point to point by entering a number. Several useful plot types are available, including scatter, box-and-whisker, XY-line, histogram, and normal probability plots. Advanced statistics and regression analysis, graphical analysis, and data analysis are readily accessed, along with features for calculus, engineering, financial, logarithm, trigonometry, and hyperbolic functions--all crucial tools for advanced analysis. With its clear display and fast processing, the TI-83 Plus incorporates graphing tools for mathematics and science course work, including statistics and finance. Incredibly useful for college boards--PSAT/NMSQT, SAT I, SAT II, Math, IC, and IIC--the TI-83 is essential equipment for advanced placement courses in chemistry, physics, and calculus. 10 NEW TI-83 Plus (OEM) Plus Graphing Calculators, 5 I/O Link Cables, 1 CD with Software and APPs, 40 New AAA Batteries.